Spark Training Academy is proud to offer Event Management Courses in Chennai. 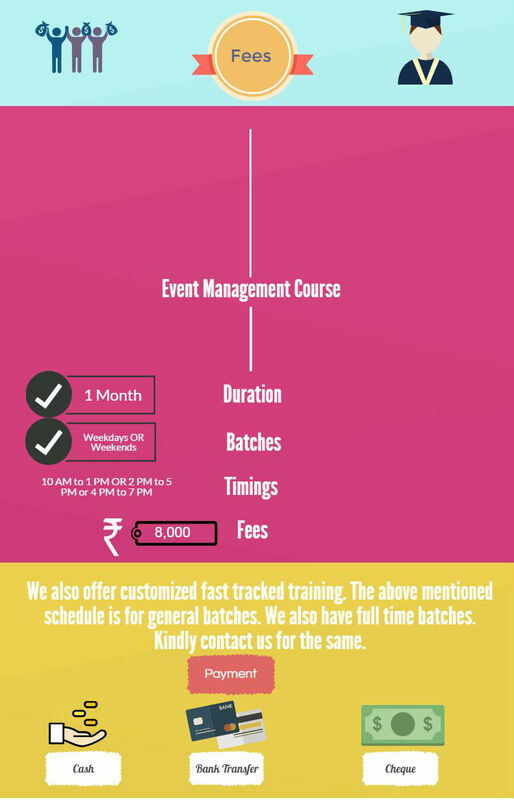 Spark offers a comprehensive Event Management Training in Chennai with Part Time facility. Apart from this course, we are also providing accounts courses. The training course provided by us is in line with the employment opportunities generated by the industry. Spark Academy is managed and owned by Clarion Enterprise Services, one of the best corporate event organisers in Chennai. Event management as the name suggests, refers to planning, creatively organizing and executing an event. ‘Event Management’, 15yrs ago, this phrase would have meant nothing in the Indian corporate world. We offer event management crash course in Chennai. Today, it conjures up the image of celebrities packaged with glamour and pomp in a gala event that is meticulously planned and slickly turned out. 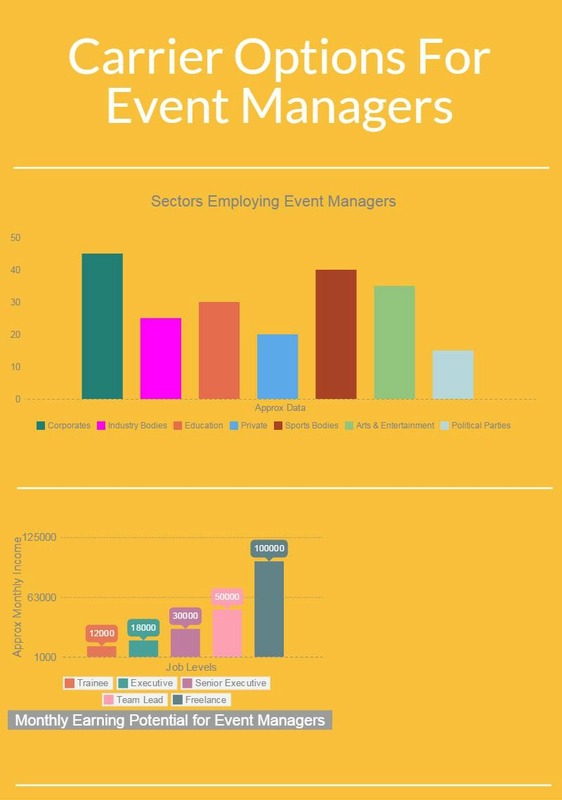 Event management in India, which was born somewhere in mid 1980s has grown into a highly professional and tech-savvy industry over the years. In 2003, the industry managed over 1,000 events, including 22 international events. For people who want to enter the HVAC industry, you can view our HVAC Training in Chennai. Although the terms are used synonymously there is a difference between the two. Event management starts from the germination between the two. Event management starts from the germination of an idea and includes organizing Events. We offer weekday and weekend based part time event management courses in Chennai.An event manager ideates on the type of event he would like to have and the audience to whom such an event should be addressed. He conceptualizes the whole event including the themes and the interactive response with his audience.He weighs the benefits likely to accrue against the cost outlay and visualizes the future impact of such an event and once he finds his perspective in place he goes ahead to organize the event. Spark Academy offers some of the best event management courses in Chennai. Find out from below the details of Event Management Courses in Chennai. I am looking for short term event management course, your information was stumbled upon while browsing for the same. I am interested to join the course as it is only one month, do you have any branches in Bangalore, because I am from Bangalore, I am 45 year old, B com graduate, was working in Central government, but had to leave job because of children upbringing. Want to know, does your course start in April 2016, if so let me know. We have sent you a detailed mail on the event management course. Please check and reply. We do not have a branch in Bangalore. We have only in Chennai. We take both weekdays and weekends for classes. Apart from this we also undertake online training too. For more details, please call or WhatsApp to 91 9677207445. We have sent you the details. Please check and reply. i am interested in event management. Is there any vacant to offer me a job?. I would like to join the event management course on weekends 2-5 pm batch. From when can I join ? We have sent you the details. Please check your email. Kindly call us or WhatsApp to 9677207445 for clarifications. I would like to join crash full time course for event management. I think spark will help me this. Ananya, we have sent you the details. please check your email. i need to join event management training . sure. please share your contact. Sure Shanmugi, Can you please let us know your contact details so that we explain you the course. I have written my 12th std and waiting for my results. I will be free 3moths I wish to do event management. Can I do??? Sure. you can do. Please meet us for the batch timings for the summer. Also, kindly provide your contact details. What are the short term one month or 2 month courses that you provide for event management . Please check your email. We have sent you all the details regarding the course. Kindly provide us with your contact number. What are the batches for the summer? During the month of May and June? I have just completed my 12th and I am interested in doing event manangement. Doing it now will be better ? Or doing the course along with college? Though I am free in May and June as well. Kindly send the Details for Online Event management course… and also the JOb opportunity if i complete event management in online??????? I have completed my 12th and waiting for results , as I want to join the course can you provide me with information like the course timing, when to start,etc.. I would like to do a course n event management .. am a home maker without any work experience.. can i go fr this? Thank you for inquiring with us. We are glad to receive the same. Yes, this is a vocational program and does not require experience. It is a field where you require passion to work more than experience. We have sent you all the details regarding the course to your email. Kindly check and reply with your confirmation. Thank you for your inquiry. We have sent you the details. Please check your email and reply to us. I’m interested in event management course.. Kindly let me know de details. We have sent you the details. Please check your email. We are starting a batch this month. Please provide your contact number to speak to you. I am interested in the weekend batch course for 1 month. Can i know when the new batch will start? Also, the details for venue and payment options please. I am interested to join event management course… I need more details about the course and may I get contact number for more queries.. I completed my Engineering and i wanted to make my career in the field of event management.Can u provide me with the details of this course? Can you please send me the list of Event Management Courses with details. I have completed MBA and thinking of starting my career in event management. Is it only one month or do you have courses for longer period(three months). I have completed MBA and thinking of starting my career in event management. Is it only one month or do you have courses for longer period(three months)? Can i get more details about the course and the opportunities after course completion. I would like to join in a short term course on event management. It would be great if I could get more information on whom to approach to ask more questions on timings and duration of the course and the variety of course that are being offered.. Thank you. Does this event management course can be useful for marriages or any other functions? Does this event management course can be useful for marriages or any other functions? Is there any online training on this? can i know the location and further details.. Event management course details along with your address and duration of the course etc.. I need details about your courses offered ….. And I’m in chennai. I am interested with this course. Kindly send me the venue and fee details. And also please let me know, whether this course will be practical or theoretical? will get certificate? will get job opportunities after completion ? Hi Spark academy, I’m really interested in taking up event management course. Your description about the course seems to be very catchy and useful. Can you please share further details. 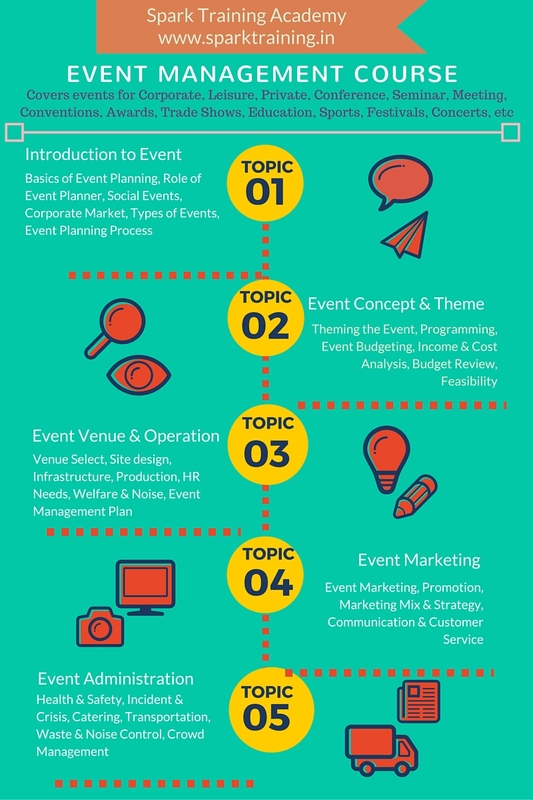 I would like to know the entire details of the event management course including the location of your center..
Hi, i am interested in event management jobs. I am looking for courses in chennai. Please provide me location and time details. Crash course details as well. hii….i’m very much intrested in event management…could u tell which makes ur academy best from others?? I’m interested in event management course.. Kindly let me know the details and fees details. Hi,I am interested with this course. Kindly send me the fee structure and also please let me know, whether this course will be practical or theoretical? will you give certificate? Can i have the course details and fees structure of the course and the institute address. Can you help me with a detailed information over the mail regarding the training courses in Event management. Thank you. I would like to know if there is anything that I can contibute towards event management. I would even be interested to know if there is any job vacancy. Kindly let me know for any details required. Does this event management course is for three yrs ?can we get the certificate for this course? Hello Sir, Is there an MBA course in Event management in Chennai or elsewhere in South India. can you guide me in this matter. I’m interested in event management…I want to know more details. So kindly provide me more details…thank you..!! Hi I want to know more about the course… could you please send me the complete details…. what are the courses , how it works , is there have any placement option also? I am a marketing person and I was searching for an event management course in Chennai. I intend to do event management course part-time in Chennai. Do you guys offer this course part-time? I hope you would also be covering areas like event decorations, event planning etc. Please reply me with the details. Thank you for contacting us. Yes, we do cover the event management course in Chennai in Part-time. We have sent you the details to your email address also please drop your phone number to communicate. Of course, we do cover event decoration too.